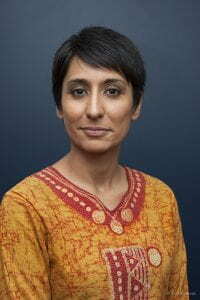 Irshad Manji is an international bestselling author, Muslim reformer and media entrepreneur. The New York Times called Irshad “Osama bin Laden’s worst nightmare.” A faithful Muslim who openly advocates equality for women and minorities, she practices moral courage – doing the right thing in the face of one’s fears. After publishing two seminal books about why and how to achieve liberal reform within Islam, Irshad founded the Moral Courage Project at New York University. She is now developing its West Coast chapter at USC. The project produces Moral Courage TV, voted one of the most inspiring channels on YouTube. MCTV features individuals who are risking personal and professional backlash so they can improve their societies. Most recently, the channel won the Ron Kovic Peace Prize, in honor of the Vietnam vet who became an anti-war activist and inspired the Oliver Stone movie, Born on the Fourth of July. Irshad came to media entrepreneurship through the printed word. She has written The Trouble with Islam Today: A Muslim’s Call for Reform in Her Faith (St. Martin’s Press, 2004); Allah, Liberty and Love: The Courage to Reconcile Faith and Freedom (Simon & Schuster, 2011); and Don’t Label Me: An Unusual Conversation for Divided Times (MacMillan Publishers, 2019). They are translated into a total of 34 languages. In-between her books, Irshad created the Emmy-nominated PBS documentary, Faith Without Fear. It chronicles her journey to convince fellow Muslims that questioning religious authorities is necessary – and possible. An educator at heart, Irshad speaks at high schools and universities throughout the United States — and beyond. Her ideas have reached audiences as varied as Amnesty International and the Royal Canadian Mounted Police. She also brings her message of moral courage to the airwaves, frequently appearing on networks such as Al Jazeera, CNN, MSNBC and HBO. Currently, Irshad is designing an online course to equip teachers who want to mentor their students in building moral courage. At the same time, she is writing her next book, a provocative new take on diversity that will make us all rethink how we see each other and ourselves. St. Martin’s Press will publish it in late 2018. African by birth, Canadian by citizenship and American by immersion, Irshad now lives in Hawaii with her wife, Laura, and their five rescue dogs. She has refused to give in to Laura’s lobbying for a pet pig — so far.